We’re only halfway through June and we have more crazy adventures to tell. This week, we talked about the love teams that made us swoon, movies that made us cry and so much more. Monday Mix Tape: Our Little Infinity – Because movies like The Fault in Our Stars are made even better by an awesome OST. Time Management 101 For Working Students – School starts this month and some students need to juggle school and work. Here are some useful tips for our working students. 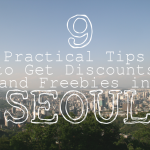 9 Practical Tips to Get Discounts and Freebies in Seoul – A trip to the land of kimchi and KPOP won’t be complete without some handy tricks to get the best discounts. Reminiscing Our Favorite ’90s Pinoy Love Teams – The war on who’s the best ’90s love team continues. Rico and Claudine or Jolina and Marvin? 11 Words of Wisdom We Learn From the School of Life – The greatest thinkers share a great deal on learning in this collections of their wise words. To the Special Man in My Life – Here’s a short love letter to the man we first loved. We start to say goodbye to summer and hello to rainy days this week. But it doesn’t mean we need to hide away the the bright clothes and start taking out the dark ones! What are your favorite stories? What else do you want to see on our website? Share your answers in the comment section!